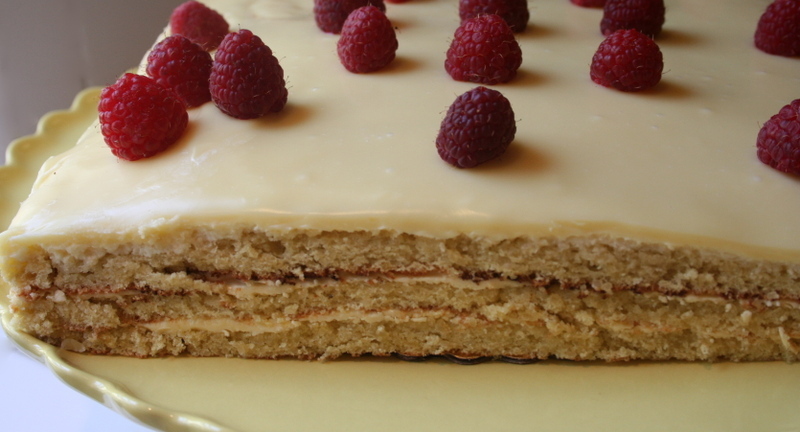 I thought I would have to pass on this month's recipe, which was created by our very own Breadchick, who is the host for this month's challenge. But, decided that it wouldn't be too hard, because I already had starter in the fridge, and my Mixmaster would do all the hard work. 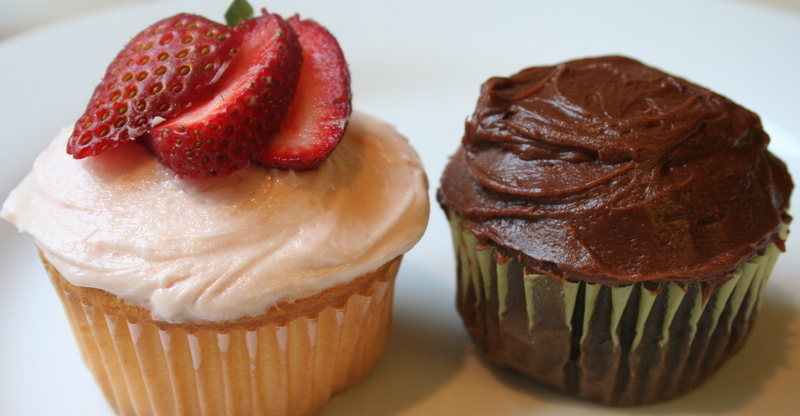 Plus, several of the Babes had baked test runs, and I could take advantage of their tips. 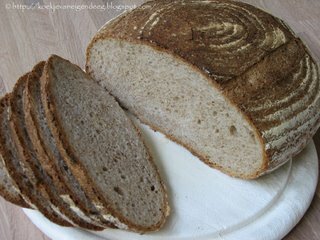 And, how could I skip making rye bread? At one time, I made it several times a month, so it was too tempting to pass this up. Mary's recipe contains a small amount of onions in the starter, which I've never used before when I made rye bread. I would have used fresh onions, but decided it would be easier to use some Penzeys dried onions lurking in my pantry. I liked this bread very much, it makes great sandwiches. Next time, I'll use fresh onions, as my dried onions were a bit old, so the flavor was muted. 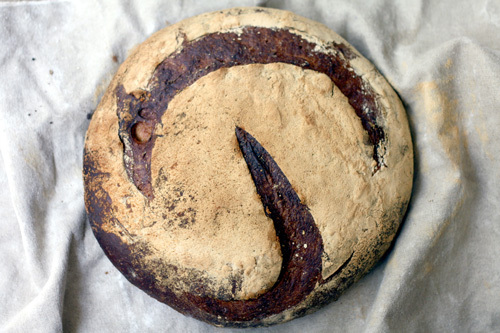 The title of the bread is Dark Onion RYe. 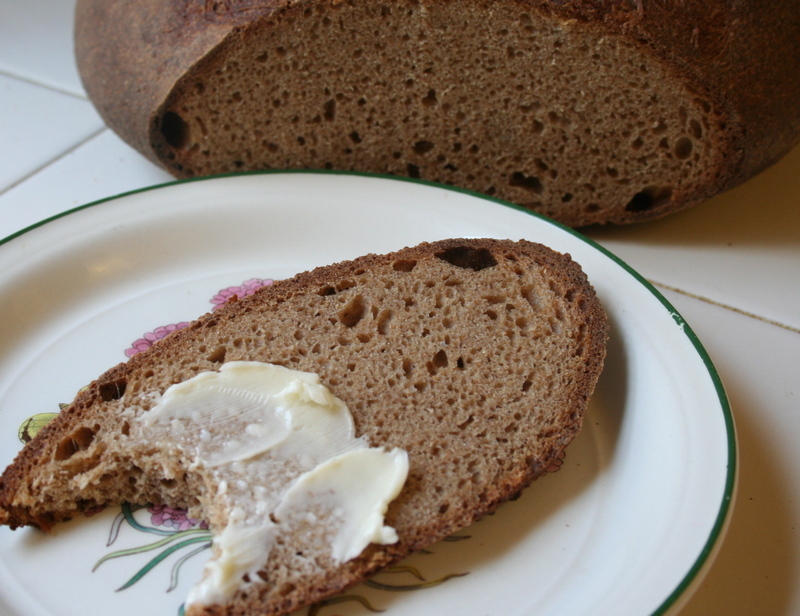 However, the molasses I used wasn't the darkest variety, and the color of the bread was a tad light--but the great taste trumped that problem. 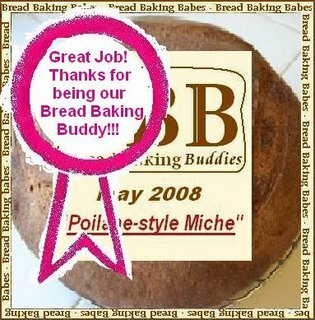 Note: If you sent me an e-mail with a link to your site about the Poilane-Style Miche, and you aren't listed below, please leave it in the comment section below and I'll add you. My server has been crashing as I try to open mail or write this post on Typepad! Despite a formidable looking recipe, our valiant Bread Baking Buddies decided to try their hand at making the Poilane-Style Miche. And the results are beautiful. Here they are! Please go to their blogs and see how they did it. First out was Ulrike at Kuchenlatein, who produced her marvelous loaf in record time, because she already had her own starter in her fridge! Well done. We should all be so well prepared. 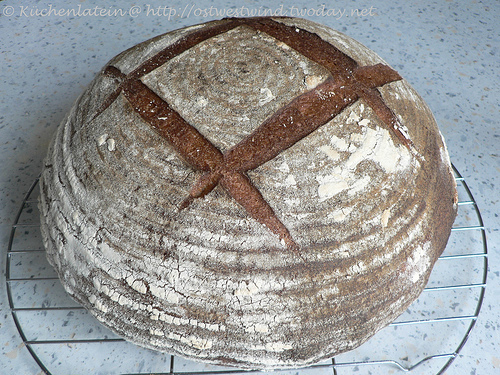 My friend Astrid at Paulchen's Food blog made this beautiful loaf, adding spelt flour to the dough. It was her first attempt at sourdough, and it came out great. 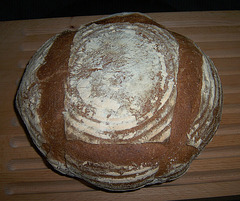 Gea at Koekje Van Eigen Deeg produced this lovely loaf. Looking at those perfect slices makes me hungry for a sandwich. Corned beef, anyone? Unfortunately, I left out Soepkipje at Ipernity! Look at this beautiful loaf. That was a crime! I also left out Gretchen at Canela & Comino! She had to contend with the fact that she can buy almost any kind of flour, but whole wheat flour wasn't available. But, like a true baker, she persevered and created her beautiful loaf. Judy at Judy's Gross Eats was faced with the eccentric nature of this starter. But, she persevered (thank heavens for us) and produced beautiful bread! 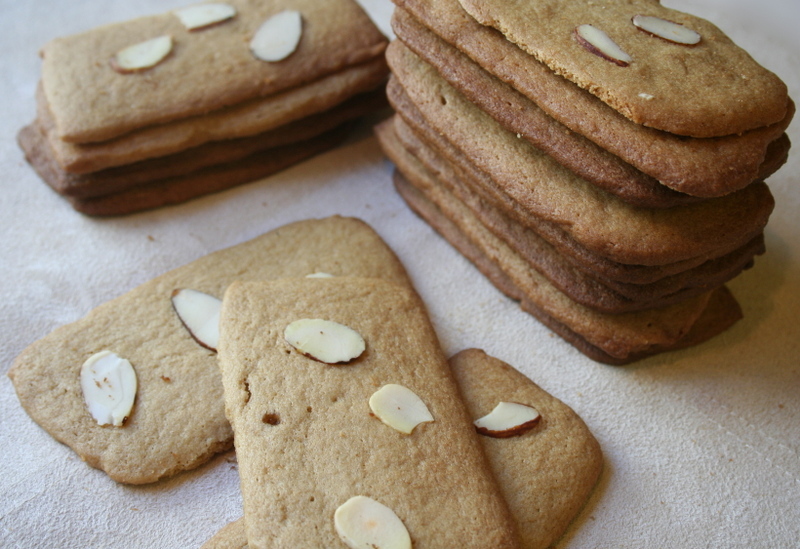 Several years ago, I bought Maggie Glazer's magnificent book, Artisan Baking and fell in love with two recipes. 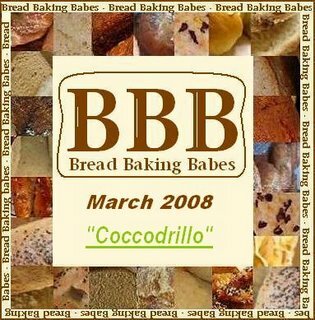 The first recipe I made was Hi-Rise Corn Bread, which launched Tanna and me into a frenzy of one upping each other in different ways to eat those heavenly yellow loaves of bread. I think she won the contest with her toad in the holes. The other recipe that I longed to make was the Sullivan Street Potato Pizza, named after the bakery that produces it in New York City. 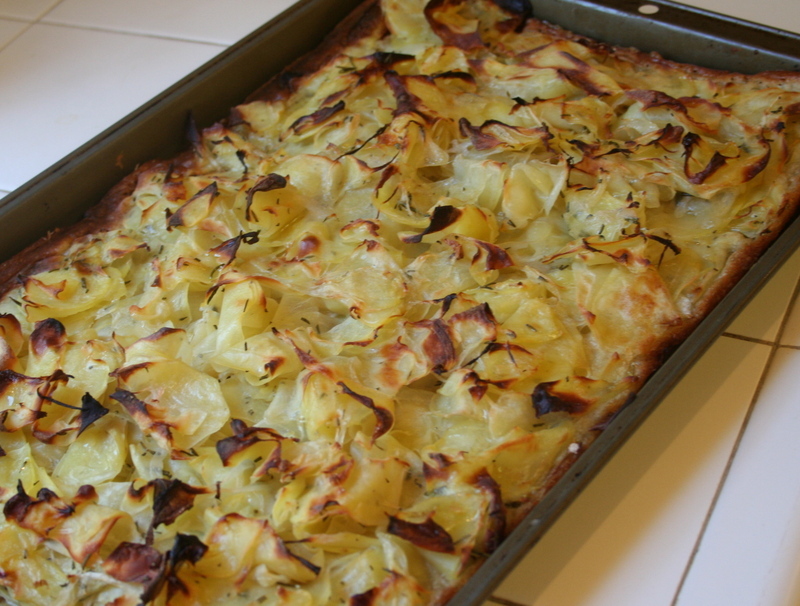 It looked wonderful in the book, a foccacia like bread topped with a mountain of thinly sliced potatoes, onions and chopped rosemary. After years of procrastination, I finally made it, thanks to the Bread Baking Babes, and Tanna, our hostess for this month. Several of the Babes made the pizza before my attempt, and I knew that the crust was proving difficult. So, I was forewarned when I chose to make the pizza for dinner with my cousins, Charmayne and Keith. I can't say that the pizza was a marvelous as the Hi-Rise Cornbread, but it was quite a hit at the dinner. Is the world ready for another baking group? 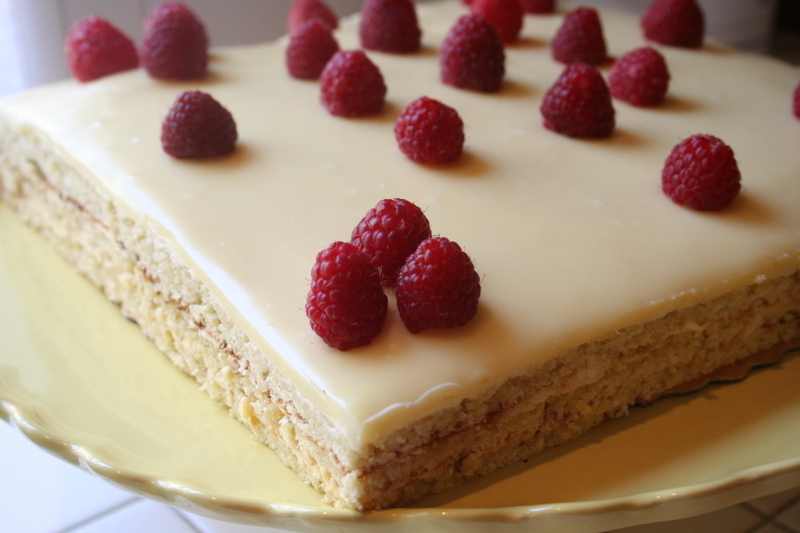 And what compels baking aficionados to seek others with the same obsession (affliction)? 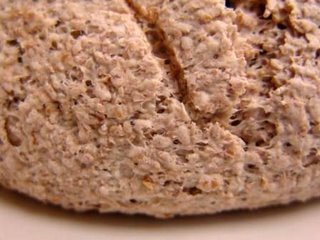 Is it the influence of the leavening ingredients? I don't know, but there are a lot of us out there. 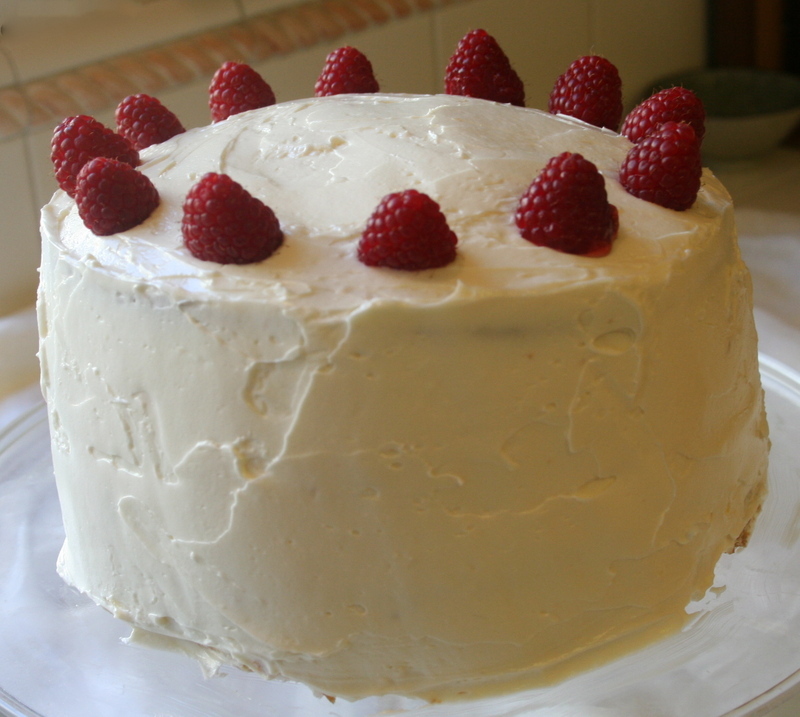 Just look at the success of the Daring Bakers. 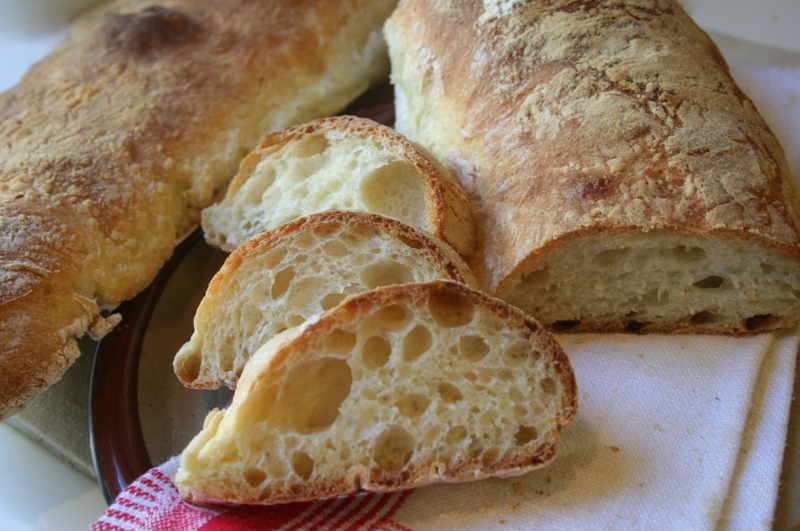 My love for bread is so deep, the opportunity to join with another group, devoted to yeast dough, was perfect. The name of this group is Bread Baking Babes. And when Tanna extended an invitation to join, how could I refuse? I could satisfy my constant desire to feel yeast dough in my hands. And truth to tell, I was smitten with the fact that I'm now officially, a real babe. 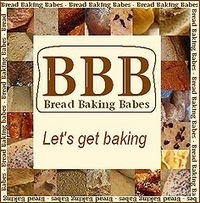 Our first project is being hosted this month by the lovely Karen at Bake My Day. 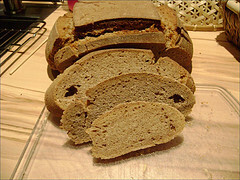 The recipe is a fabulous, to die for bread, called Royal Crown's Tortano. 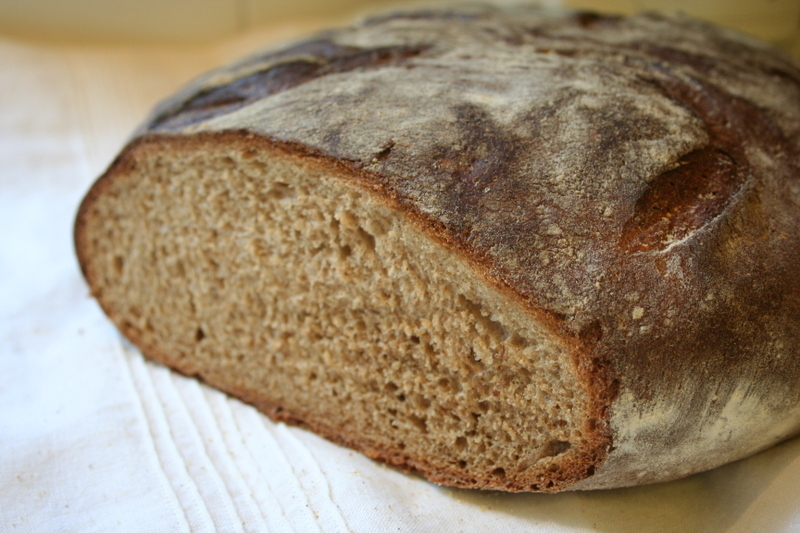 It makes a big round loaf with a strong yeast flavor and deep chewy crust. 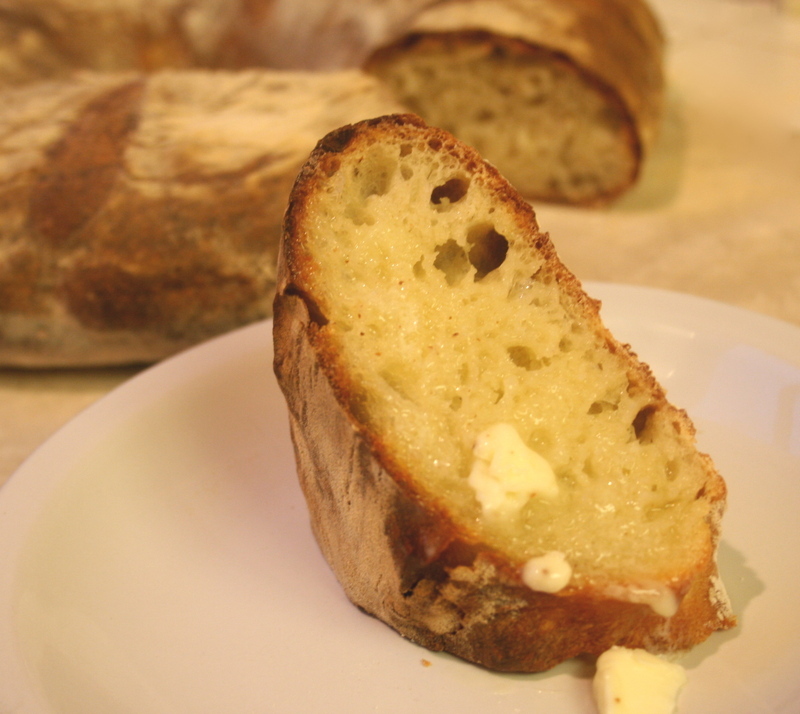 I made the recipe twice, and while my results were imperfect, the bread itself was marvelous.